February… Peak of winter and interview season! Some of you must be preparing anxiously for your upcoming interviews. I had my interview for Nottingham in the middle of February. The wait before the interview was full of panicked preparation. It didn’t help that I was quite clueless about MMIs but fret not, here’s a breakdown of what usually happens during an interview. Medical schools in the U.K. either do the traditional panel interview or the Multi-Mini Interviews (MMIs). Most universities are switching to the MMI format (Nottingham has). A good idea would be to check out what each university expects on their website- there is usually a paragraph on interviews in the FAQ section. I remember reading through lists of questions that could come up, and preparing my answers. In some form or the other, most medical schools will ask questions related to ethical scenarios (pro-tip: know the four principles and confidentiality and informed consent! ), your personal statement (know it inside out! Can you recite it in your sleep? The answer should be yes), why you want to do medicine and perhaps some sort of analytical task (don’t worry too much about this one, the important thing is to remain calm and if you don’t understand what to do, just ask). The answer to “why do you want to do medicine?” should come naturally- medical schools are looking for genuine applicants who show a keen interest and passion for the field. Yes, cheating is wrong and there are severe consequences for doing so. Would you have expected your friend to cheat? What factors would have led her to cheating? Was she perhaps distracted or stressed at home due to a family issue and hence not have time to study enough? Basically, try and show that you would consider that there are shades of grey to every situation. Some universities might have role play stations. The important thing is to remember to portray yourself as a caring and empathetic individual who is not judgmental. I remember walking out of my interview and thinking “oh gosh I didn’t ask anything about how she injured herself or anything remotely doctorish,” but that’s okay! Be relatively prepared to talk about your work experience and why you want to go to that university. Do proper research into the university’s course structure, the extra-curricular activities offered etc. I was ready to talk about why I loved Nottingham’s course so much- from full body dissection to the 3rd year dissertation to early clinical placement. It’s also a good idea to keep abreast with the happenings of the NHS and current affairs; let’s not forget that the NHS is very much tangled up in Brexit and that it’s relatively unsustainable at this point in time (hopefully that will change). “Why have you applied to medicine despite all the negativity towards the NHS in the news” might be something you want to think about. Good luck with your interviews! Hope they go well and remember to be as genuine as possible and show your passion for medicine. 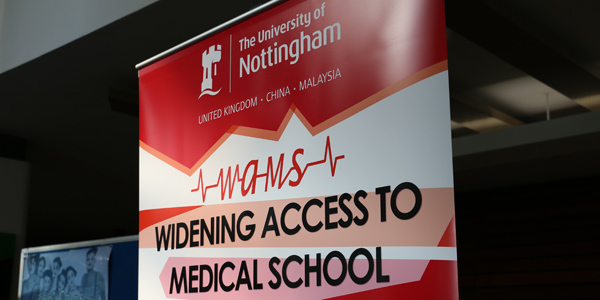 Don’t forget to keep an eye out for WAMs (Widening Access to Medicine) events related to the application process!